I was planning on writing more about fish today, but have gotten a bit side-tracked thanks to the Marché Président-Wilson. This morning I set out to discover a new farmers’ market in a neighborhood that I don’t know very well, and… what a treat! Located in the 16th arrondissement, this food market finds its home twice a week (Wednesday and Saturday mornings) on avenue du Président-Wilson, between rue Debrousse and place d’Iéna. I discovered the market thanks to a great little book, Cuisiner comme un chef à Paris by Corinne Lacoste. Armed with a few canvas shopping bags and 30 euros, I got off at metro stop Iéna, curious about what I might find. At first sight, the market looked like any other, two lines of discolored white awnings paving the way down the center margin of the street. Once I eyed the first stands, however, I knew this market was different than the others I’ve been to in Paris so far. The fruits, veggies and various other delicacies all shouted quality and originality. I always take it as a good sign when the bell peppers and tomatoes come in awkward shapes and unique hues. Since it’s both the middle of the week and les grandes vacances (summer vacation) there weren’t too many customers; the atmosphere was calm and relaxed- not the usual Parisian market! Nevertheless, a line of friendly, talkative vendors smiled behind each stand. I wandered from booth to booth looking, gaping and asking questions. I was enticed by both the sellers’ recommendations and the products themselves. What did I end up with? While I was tempted by almost everything, there were a few things I just couldn’t pass up. I was especially amused by the display of unusual colors and bought a bagful of purple potatoes– perfect for either a summer salad or finely-sliced chips, the vendor told me. Since I’d started off on a purple theme (though I quickly deviated), I was pulled toward an enticing stand with a wide array of natural violet shades, from eggplants to choux-raves (kohlrabies, also known as turnip cabbages). This was Joel Thiebault’s vegetable stand and quickly became one of my favorites. How could I not enjoy buying a mini purple cauliflower and a bunch of happy-looking squash blossoms from the same maraîcher that supplies the well-known chef Pierre Gagnaire? According to my little book, Thiebault’s produce is sought after by Gagnaire and other renowned Parisian chefs. My squash blossoms (whose fragrance instantly took me back to my childhood in New Mexico) were carefully wrapped up in brown paper and handed to me like a bouquet of delicate flowers. The young woman who was helping me also assisted me in choosing from an endless variety of mysterious-looking tomatoes. I ended up with three sorts: one green, one red and several tiny ones (red, yellow and greenish-red). I promise to take better note of the names next time! I always appreciate the chalk-board signs hanging above the products at open-air markets. They give the name, price and where the product comes from. Whenever possible I buy local, both for the environment and to support community farmers. At this market it was no problem finding a wide array of French-grown produce. Fresh brown eggs, organic peaches, chives, spicy Tunisian-style olives, small round Portuguese breads… Oh, I can’t forget the salt. The last items I picked up were two bags of sel de Guérande. This is natural sea salt that is harvested in the marshes of the Guérande peninsula in Southern Brittany. It’s rather course and collected by hand using traditional methods. Sel de Guérande is especially well-known for its high concentration of magnesium and low concentration of sodium. The vendor, Lutetia, proposes a large variety of salt products. I ended up with a package of salt mixed with different herbs, including basil, rosemary and sarriette (savory). I was told it would be useful in cooking such things as fish and vegetable stocks, or for use in salads. Last, a tiny package of sel à la cannelle (cinnamon) winked at me and jumped in my bag- I told it no, but it insisted! In simple words, the Marché Président-Wilson is a place for rare-finds and high quality. 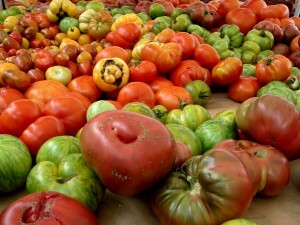 I’ve already dug into my yellow and red-green tomatoes- full of just-off-the-vine flavor and dripping with sweet juice. What would goat-cheese filled squash blossoms à la cannelle be like? 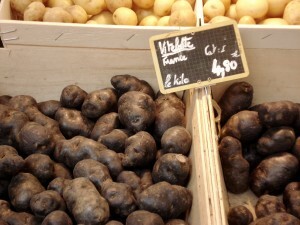 This entry was posted in Paris Food Markets and tagged markets, vegetables. Bookmark the permalink.